Hemoglobin and myoglobin are two types of globin proteins that serve as oxygen-binding proteins. Both proteins are capable of increasing the amount of dissolved oxygen in biological fluids of vertebrates as well as in some invertebrates. Organic prosthetic groups with similar characteristics are involved in the binding of oxygen in both proteins. But, the 3-D orientation in the space or the stereoisomerism of hemoglobin and myoglobin are different. Due to this difference, the amount of oxygen that can bind with each of the protein molecules is also different. Hemoglobin is capable of binding tightly with oxygen whereas myoglobin is incapable of binding tightly with oxygen. This difference between hemoglobin and myoglobin gives rise to their different functions; hemoglobin is found in the blood stream, transporting oxygen from lungs to the rest of the body while myoglobin is found in the muscle, releasing oxygen needed. Hemoglobin is a multi-subunit globular protein with a quaternary structure. It is composed of two α and two β subunits arranged in a tetrahedral structure. Hemoglobin is an iron-containing metalloprotein. Each of the four globular protein subunits is associated with non-protein, prosthetic haem group, which binds with one oxygen molecule. The production of hemoglobin occurs in the bone marrow. Globin proteins are synthesized by ribozomes in the cytosol. Haem part is synthesized in the mitochondria. A charged iron atom is held in the porphyrin ring by covalent binding of iron with four nitrogen atoms in the same plane. These N atoms belong to the imidazole ring of the F8 histidine residue of each of the four globin subunits. In hemoglobin, iron exists as Fe2+, giving the red color to red blood cells. Humans have three hemoglobin types: hemoglobin A, hemoglobin A2 and hemoglobin F. Hemoglobin A is the common type of hemoglobin, which is encoded by HBA1, HBA2, and HBB genes. The four subunits of hemoglobin A consist of two α and two β subunits (α2β2). Hemoglobin A2 and hemoglobin F are rare and consist of two α and two δ subunits and two α and two γ subunits, respectively. In infants, the hemoglobin type is Hb F (α2γ2). Since hemoglobin molecule is composed of four subunits, it can bind with four oxygen molecules. Thus, hemoglobin is found in the red blood cells, as the oxygen carrier in the blood. Due to the presence of four subunits in the structure, the binding of oxygen increases as the first oxygen molecule binds to the first haem group. This process is identified as cooperative binding of oxygen. Hemoglobin makes up of the 96% of the dry weight of a red blood cell. Some of the Carbon dioxide is also bound to hemoglobin for transportation from tissues to lungs. 80% of the carbon dioxide is transported via plasma. The structure of hemoglobin is shown in figure 1. Myoglobin is the oxygen-binding protein in muscle cells of vertebrates, giving a distinct red or dark gray color to muscles. It is exclusively expressed in skeletal muscles and cardiac muscles. Myoglobin constitutes of 5-10% of cytoplasmic proteins in muscle cells. Since the amino acid changes in the polynucleotide chains of hemoglobin and myoglobin are conservative, both hemoglobin and myoglobin bear a similar structure. Additionally, myoglobin is a monomer, composing of a single polynucleotide chain, composed of a single haem group. Therefore, it is capable of binding with a single oxygen molecule. Thus, no cooperative binding of oxygen occurs in myoglobin. But, the binding affinity of myoglobin is high when compared to that of hemoglobin. As a result, myoglobin serves as the oxygen-storing protein in muscles. Myoglobin releases oxygen when the muscles are functioning. 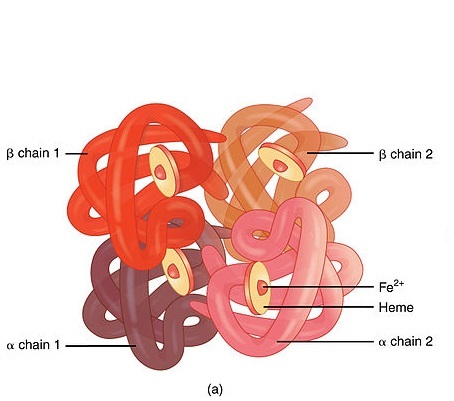 3-D structure of hemoglobin is shown in figure 2. Both hemoglobin and myoglobin are oxygen-binding globular proteins. Both of them contain the oxygen-binding haem as their prosthetic group. Both hemoglobin and myoglobin give the red color to the blood and muscles respectively. Hemoglobin: Hemoglobin is a red protein which is responsible for transporting oxygen in the blood of vertebrates. Myoglobin: Myoglobin is a red protein with haem which carries and stores oxygen in the muscle cells. Hemoglobin: The molecular weight of hemoglobin is 64 kDa. Myoglobin: The molecular weight of hemoglobin is 16.7 kDa. Hemoglobin: Hemoglobin is composed of four polypeptide chains. 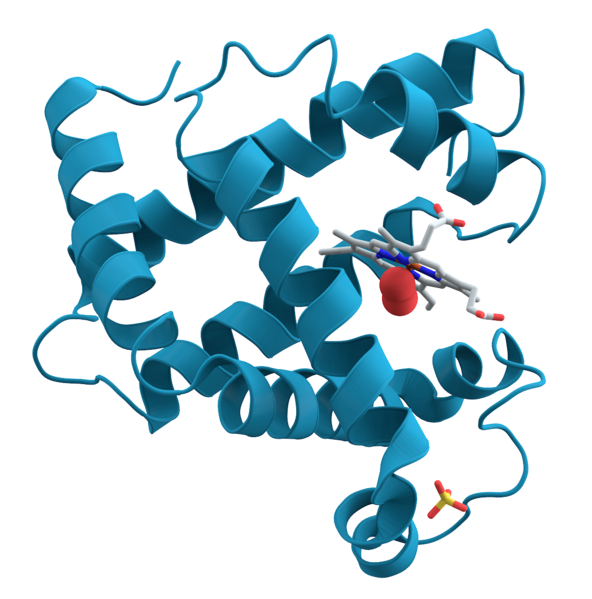 Myoglobin: Myoglobin is composed of a single polypeptide chain. Hemoglobin: Hemoglobin is a tetramer composed of two α and two β subunits. Myoglobin: Myoglobin is a monomer. Therefore, it lacks a quaternary structure. Hemoglobin: Hemoglobin binds with four oxygen molecules. Myoglobin: Myoglobin only binds with a single oxygen molecule. Hemoglobin: Since hemoglobin is a tetramer, it exhibits cooperative binding with oxygen. Myoglobin: Since myoglobin is a monomer, it does not exhibit cooperative binding. Hemoglobin: Hemoglobin has a low affinity to bind with oxygen. Myoglobin: Myoglobin has a high affinity to bind with oxygen, which does not depend on the oxygen concentration. Hemoglobin: Hemoglobin is capable of tightly binding with oxygen. Myoglobin: Myoglobin is incapable of tightly binding with oxygen. Hemoglobin: Hemoglobin is found in the blood stream. Myoglobin: Myoglobin is found inside muscles. Hemoglobin: Hemoglobin A, hemoglobin A2 and hemoglobin F are the types of hemoglobin in humans. Myoglobin: A single type of myoglobin is found in all cells. Hemoglobin: Hemoglobin takes oxygen from lungs and transports to the rest of the body. Myoglobin: Myoglobin stores oxygen in the muscle cells and releases when needed. Hemoglobin and myoglobin are two oxygen-binding globular proteins in vertebrates. Hemoglobin is a tetramer that cooperatively binds with four oxygen molecules. Myoglobin is a monomer composed of a single haem group. Since the binding capacity of hemoglobin is higher than that of myoglobin, hemoglobin is used as the oxygen-transporting protein in the blood. Myoglobin is used as the oxygen-storing protein in muscle cells. The affinity of binding oxygen with myoglobin is higher than that of hemoglobin. The main difference of hemoglobin and myoglobin is in their function. The functional difference of hemoglobin and myoglobin arises due to the difference of their 3-D structure. 1.” Myoglobin.” Hemoglobin and Myoglobin. N.p., n.d. Web. Available here. 05 June 2017. 2.”Myoglobin.” Encyclopædia Britannica. Encyclopædia Britannica, inc., n.d. Web. Available here. 05 June 2017.